I love fresh homemade bread. Once, in my early twenties, I made a loaf by hand. I had picked up the classic Tassajara Bread Book from a remainder table, and one afternoon I went at it for several hours, kneading and punching away. It made a glorious loaf which we happily devoured straight out of the oven, but the effort-to-results ratio was just too high, and I couldn’t imagine going through that ever again. Many years later, I bought a bread maker. Aside from an annoyingly difficult-to-clean paddle, the process was vastly simplified, and the results also quite good. That bread maker is still in a box in our garage, but our current kitchen (which we are likely to have for quite a few more years) is too small to make single-use appliances very practical — there’s no place to store something so large either on the counter or in the cabinets. So I’d given up on homemade bread for the foreseeable future, until sometime last year when I started running across references online to ‘no-knead bread.’ I was skeptical, but positive reports abounded. Last weekend I finally decided to try this miracle for myself. At his last annual checkup, Jak tripped the alarms for ‘pre-diabetic’ levels of blood sugar, and as a result I’ve made an extra effort to stick to whole grains and low-glycemic foods. Which is why I ignored the very attractive white-flour no-knead options and went straight for the whole wheat ‘bread brick’ introduced by New York Times food writer Mark Bittman. Here’s the recipe; the only adjustment I made was to use extra wheat flour in place of the rye I didn’t have. It’s arguably not the most beautiful loaf ever, but it sure is yummy. I worked out the cost per loaf to be around 80¢ at regular price; by watching for sales on flour and yeast I can probably bring that down by a dime or two. The dense whole-grain bread I’ve been buying for Jak at Costco is something over $2 per loaf, though the loaves are slightly larger. 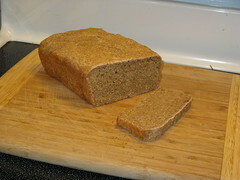 Still, at a conservative estimate, switching to the homemade bread should save us $1.20 a week, or about $60 per year. Frankly, though, homemade bread is so much better than anything storebought that I’d do it even if it didn’t save a penny!